Welcome to Hi-Tec Industries - Vancouver Island's most respected manufacturer of roof truss and floor truss systems for residential and commercial buildings and a leading supplier of engineered beams and floor systems. 40 Years Experience in Manufacturing quality trusses - We know what you want! Located on the Island Highway in Lantzville (between Nanaimo and Parksville) where we are strategically situated to service all of Vancouver Island and the Gulf Islands. Our central location and proximity to ferries and docks allows us to equally serve Victoria to Port Hardy, Salt Spring to the West Coast. Our experience tells us that service and advice are as important as the final price. 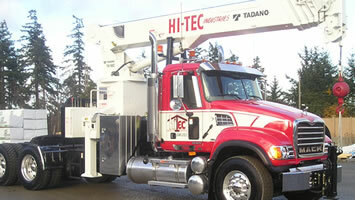 At Hi-Tec we endeavor to form lasting relationships and won't treat you as just another customer. Big builders, small builders and owner builders all have different needs - what ever type of builder you are, we make sure your requirements are met and your project runs smoothly. We don't just want this job; we want all of your roof truss, floor truss or engineered wood product's jobs.